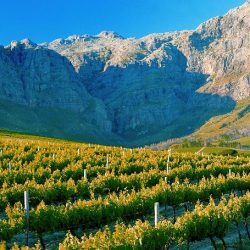 Stellenbosch lies in the centre of the fertile and very scenic winegrowing area of the Western Cape, less than an hour’s drive out of Cape Town. With its numerous diligently restored buildings in the Cape Dutch style and its renowned university, it is one of the most attractive travel destinations in the Cape. 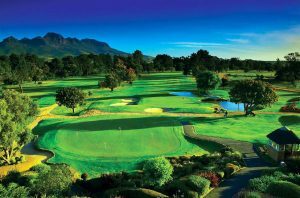 Scenic and in excellent condition, Stellenbosch presents a fair challenge with some memorable holes. The stroke index 1 hole does not give up par easily. To reach this par four in two you need a long drive followed by an approach over some out-of-bounds vineyards to an elevated green. The course is well protected from the wind as the relatively narrow fairways are lined with trees. Hole 8 (par 5) requires for instance an absolutely straight stroke in order for the ball not to land in vines or bushes. Surrounded by mountains and vineyards, this scenic course is in excellent condition and presents a fair challenge with some memorable holes.